Luneo Hope is a nom de guerre. My name is Helena Wiehahn, and I live in the Cape Winelands. You may wonder what on earth an academic enthusiast is. I cannot merely box myself as a front-end developer, a designer, or an analyst. I like to spend my time acquiring new skills and helping others. I love to learn, read and apply new ideas. So, for the time being, I am a front-end developer, but I will forever be an academic enthusiast at heart and in search of more significant challenges. The National Research University Higher School of Economics is consistently ranked as one of Russia's top universities, a leader in Russian education. I will be completing modules here from August 2018 to January 2019. You can follow me on Blogger or Steemit for more information. Based in South Africa, our developers across our 3 main branches contribute to our clients’ unique customized products, through our vast collective experience and expertise. We currently serve customers in the US, Europe, South Africa, Australia and many other countries. The current management software in use includes Trello, Float, BugHerd, Toggl, Clockify, Slack, and Gsuite. After my four-month Agile Methodologies and Project Management course I attended at the Higher School of Economics, Moscow, Russia I attended a two-day job shadow for a Scrum Master position at Capfin SA to gain some real-world experience to see a day in the life of a working Scrum Master. I helped out on a project at Vane Digital where some assistance was needed with the frontend development. I am an avid supporter of the Leaderless project. I assisted at Lochtec Innovations, my previous employer, to help them with front-end work on projects to help build their company. I worked directly with the owner Shawn and his wife on specified projects on a part-time basis. These are specifically front-end web development projects. JNZ Group has been a successful software development company for more than 10 years. We offer a wide range of software solutions and integrations with our PBX & Dialer solutions. We specialise in custom software development & integrations. We also specialize in Enterprize Solution for Telecommunication. Dis-Maties is a society that promotes awareness of students living with disabilities and advocates for their issues so as to ensure they have positive academic and social experiences on campus. I helped the committee run campaigns on the Stellenbosch University campus to raise awareness for disability and do fundraising for various causes. My term as a committee member ended in 2017 due to the responsibilities I have towards my Postgraduate studies and my planned trip to Russia. I will in future only serve in the capacity of an advisor and continue to update their website for them. I had the opportunity to be a speaker at Woordfees for the tenth year anniversary celebration of the disability unit at Stellenbosch University (center for student counseling and development). 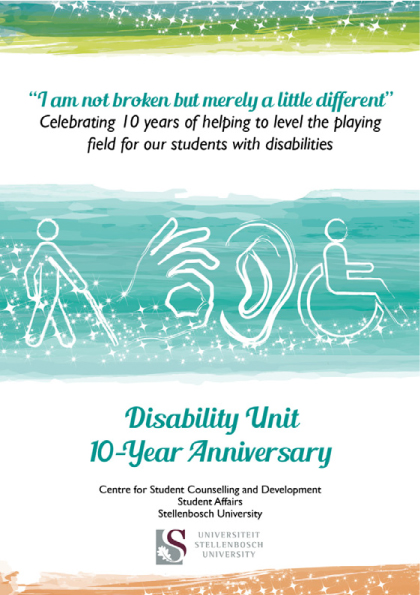 I wrote an article for the 10-year celebration booklet which was published by Stellenbosch University detailing the experience of students with disabilities. I designed characters for a range of merchandise for the society including the t-shirt designs for the members of the society. Lochtec Innovations is a vibrant marketing company situated in Cape Town, South Africa. As leaders in web design and development, graphic design, corporate branding and marketing, we offer tailor made turnkey solutions to our clients in both the national and international markets. We endeavour to offer a comprehensive package of services, ensuring that we can proactively assist and advise our clients. I successfully completed a three-month internship at an outstanding development and design company. I gained experience in setting up WordPress sites and populating them. I also designed logos, business cards, and various other products for clients. The internship was largely aimed at providing experience in the print and design industry. The squirrel is a well known Stellenbosch University mascot and I have incorporated the squirrel theme in the 2017 Dismaties merchandise rebrand. I have added a personalized touch by drawing out disabled squirrels for their branding. Animations by Paul Roux. Designer, Animator and UX specialist. Animations in projects were supplied by Paulymations. Animations created in Adobe After Effects. Dismaties aims to be a support system for people with disabilities. We advocate for their issues, and through the years we have made it our goal to promote awareness of people living with disabilities, furthering their integration into Stellenbosch society, and consequently, the world. Coffee blog was started as a side project to document the experience of enjoying different types of coffees as I travel. It is a journey for the love of coffee. Currently coffee-blog is most active on Instagram as @myawesomecoffeeblog, and will post to a web blog soon. I thoroughly enjoyed my time working with Ms Wiehahn and came to know her as a truly valuable asset to absolutely any team. She is honest, dependable and incredibly hard-working. Beyond that, she took initiative that lifted our social media presence and image to new levels! Her knowledge of graphic design & website work and expertise in marketing and design was a huge advantage to our entire society. She put this skillset to work in order to make us as a beautiful new website and a range of marketing material. She is by far the most dedicated person that I have worked with. Speaker for the SU disability unit at their ten year celebration. Woordfees Alumni speeches.